Blow mold is another most popular type of plastic molds. We can custom make all kinds of blow mold. Generally the blow mold is a cavity representing the outside of a blow molded part. 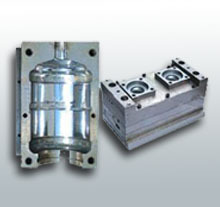 The basic structure of a blow mold consists of a cast or machined block with a cavity, cooling system, venting system, pinchoffs, flash pockets and mounting plate. Material used for blow molds: beryllium, copper, aluminum, ampcoloy. Following are the blow molds we have done for our customers.